Transport Scotland has announced that motorists using the A737 near Dalry in the coming weeks could face significant disruption to their journeys as a result of traffic management changes in the area. Traffic restrictions will be in place along a 500-metre stretch of the road, near Wilson Auctions, from Sunday (February 3rd) and will be in operation for a period of approximately nine weeks. 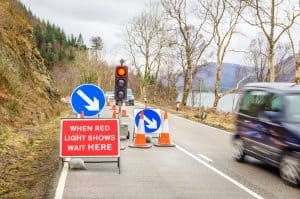 Motorists using the carriageway during this time are advised of potential delays to journeys, as temporary traffic lights will be used to hold back drivers during periods of work by highways engineers. Gavin Dyet, project manager at Transport Scotland, stated: “Work to deliver the Dalry Bypass is continuing at a steady pace, with construction of a roundabout at Hillend essential to deliver the project. Work in the area forms part of the larger Dalry Bypass scheme, which hopes to bolster the economic prosperity of surrounding businesses and the local economy by providing more reliable journey times in the future. The project is forecast to be complete by the end of 2019.